Learn the art of CSS and jQuery to master the craft of building Divi websites – and become a Certified Divi Frontend Developer. As a Certified Divi Frontend Developer, you’ll be able to land better clients, charge higher fees and grow your WordPress or Divi business with confidence and ease. 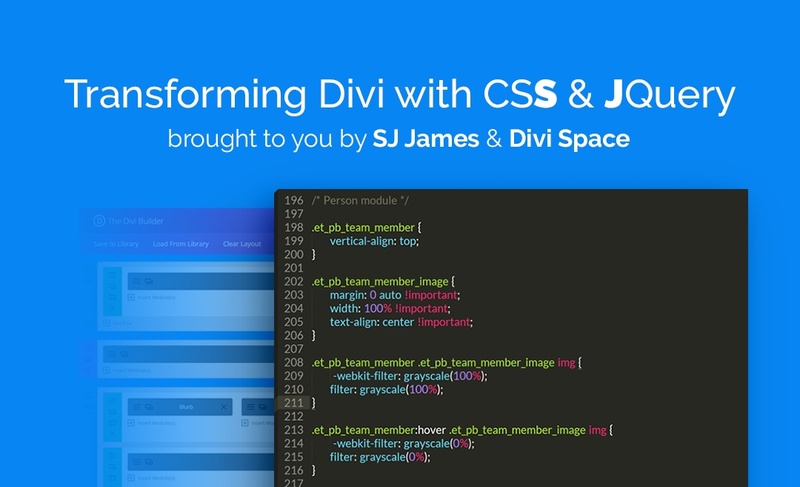 Created to help Divi users excel in their craft, the Divi Space Transforming Divi with CSS & jQuery Course will give learners deep insight into the fundamentals of CSS and jQuery to be able to begin building visually striking and functionally powerful Divi websites. As well as learning core CSS and jQuery principles, specifically for use with the Divi theme, the Transforming Divi with CSS and jQuery Course will also take learners through the step-by-step process of building a website from start to finish. Here, learners will see these two powerful code bases, CSS and jQuery, in action. Upon completion of the course, students will become a Certified Divi Frontend Developer, equipped with the skills to build exceptionally powerful and unique Divi websites. With the accreditation, learners will receive both a digital certificate as well as a badge that can be displayed on their website. Even though Divi doesn’t require custom code to perform, it’ll certainly outperform when a little code savviness is applied. Designed for Divi users that have minimal experience with customizing the framework, the Transforming Divi with CSS and jQuery course will impart valuable knowledge to Divi users of all skill levels, helping them build beautiful and deeply-functional Divi websites. Beyond the nuts and bolts of the modules and lessons, the Transforming Divi with CSS and jQuery course will equip learners with plenty of additional skills. From being able to conceptualize a design and build it up in Divi using the provided modules, to gaining confidence in using the browsers’ built-in Developer Tools, learners will be taught exactly how to approach a problem and troubleshoot it, and also, how to research development terms effectively by gaining an understand of the correct key terms, phrases and technical jargon. With the Transforming Divi with CSS and jQuery course, learners will be shown how to write clean code and build stand out Divi websites with confidence. With the course knowledge, learners can showcase even more of their web design skills to attract better quality clients, charge more for web builds and build a flourishing Divi business. Getting to know Divi A deep dive into the standard customisation options available in Divi, including: Theme and Module Customizer, Divi Theme Option (Custom CSS & Integration Tab) and inline editing options (front end editor). Taking a peak at the HTML & CSS buildup of the Divi frontend. Browser Toolkit How to use inspect element, console and other baked in tools to improve development. An intro to must have browser extensions. CSS Heirarchy and Placement How cascading works, how to override CSS and best practises for clean, well written code. Pseudo Elements What they are, why they’re awesome and usercases for how to make them work in your designs (icons, separators etc). Media Queries How they work, why we use them, best practises for mobile responsiveness. How to utilise Divi’s breakpoints for fluid design. Animations How to build your own animation, how to hack into Divi’s animations and where to find new ones. Troubleshooting When CSS simply doesn’t work, how do you fix it? Troubleshooting common issues including broken CSS, caching and overriding CSS. Five real world examples where custom CSS has been used to make Divi better A tour of five real sites that use CSS well. The jQuery Cheat Sheet 10 prebuilt lines of Jquery that can be used in a function to create stunning effects. Building a Jquery function How to build a proper Jquery function including how to specify when and where it runs. Moving & Replacing with jQuery Three common issues in modules and static pages, solved with Jquery. How to Move a div somewhere else, how to replace the contents inside a div with something else and how to create a wrapper around content (putting comments box into a toggle for example). Preparing a child theme for Jquery & CSS Building a child theme template that correctly adds CSS & Jquery. Home Page Build Walkthrough of using what we’ve learned to create the ET home page. Once the course is completed, learners will be awarded the title of ‘Certified Divi Frontend Developer’ to attest to their new knowledge base and skill set. As well as a digital certificate of achievement, learners will also receive a badge that can be embedded and displayed on their website for current and potential clients to see. With the title of Certified Divi Frontend Developer, course graduates will be viewed as a highly trained and credible web designer. Become a Certified Divi Frontend Developer and receive a digital certificate and badge to proudly display on your website. This is The Best CSS and jQuery Course for Divi – Try it Now!